Nothing in life is free -- not even a Christmas meal. 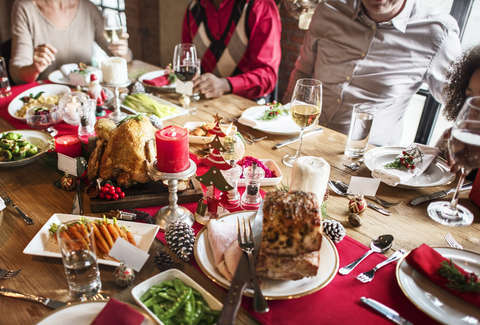 One family is learning that lesson the hard way after being told they’ll have to pay about $20 a head to attend their Christmas dinner this year. Appalled by her mother-in-law’s request, a young woman took to Mumsnet to see how others felt about the pricey new family policy. According to the post, the anonymous man’s entrepreneurial mother wants the affair catered, which you probably know, doesn’t come cheap. While the woman -- who won’t be attending the impromptu pre-fixe family feast -- said she could “understand” why her mother-in-law would ask her guests to fork over cash to cover the cost of hosting Christmas, she couldn’t shake the feeling that her partner might be paying to share a table with a straight-up Scrooge. She returned to the message board to reveal that there are “four adults (including him) and one toddler attending” the meal. It’s unclear whether the tiny dinner guest had been asked to hand over their lunch money as well. The woman noted that her partner’s mom “doesn’t charge for a normal Sunday roast” (although it may just be a brilliant way to make some cash, just saying), she couldn’t see why providing sides or dessert wouldn’t be a sufficient contribution. Others posting on the parenting blog were split. Some sided with the woman’s mother-in-law, calling her payment request “fair,” given how expensive the holidays can be with the extravagant meals and gifts on top of it all. One user even pointed out that $20 is a small price to pay for a Christmas feast with all the trimmings. Although she’s been brought to the court of public opinion, the mother-in-law in question has yet to speak out publicly about her cost-effective Christmas meal. Keep this story in mind while you’re gathered around the table with your in-laws this Christmas, fielding questions about future children, politics, when you’re getting a “real” job and what have you -- at least you didn’t have to pay to be there.